Content marketing can be overwhelming. There’s just so much content you have to produce. And there are so many different ideas and theories that surround content marketing. 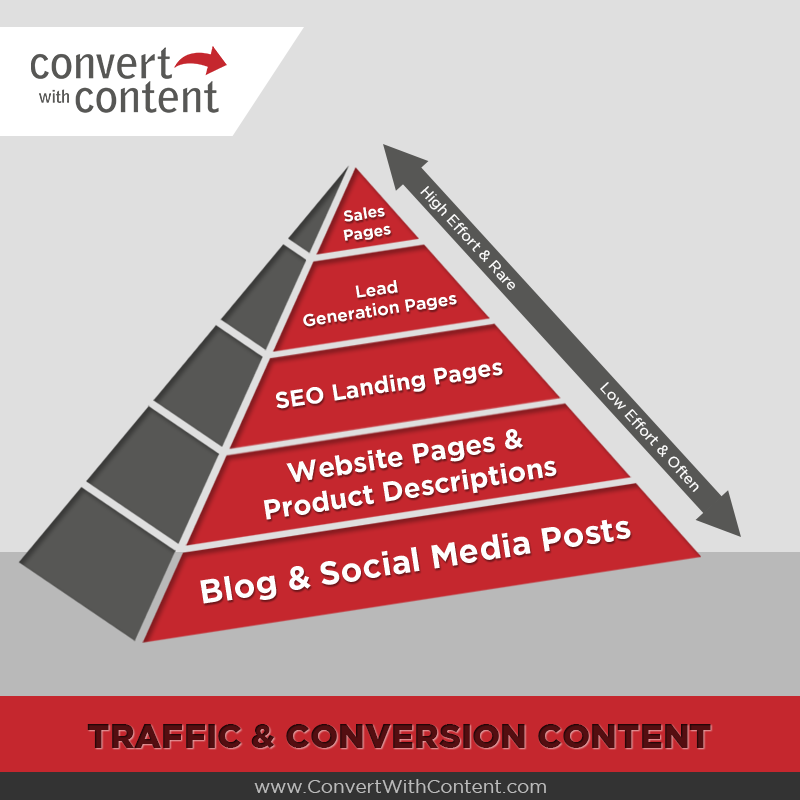 After experimenting and testing content marketing strategies on hundreds of websites, we’ve come up with our own pyramid that will help you understand what you need to do, what’s most effective and how often you should be doing it. Before you embark on your content marketing journey you have to be super clear as to what the content will be used for. Not all content serves the same purpose. And there are content marketing hacks We put it into two different categories. 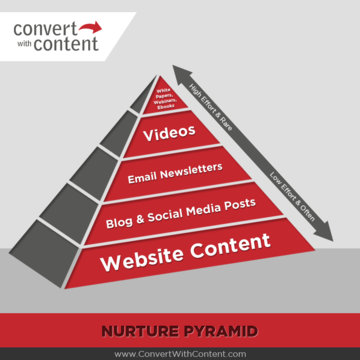 There’s nurturing content and there’s traffic producing converting content. The bottom of these graphs represent the content you can produce on a regular basis. It should be often and abundant. As you move upwards the content represented should be very high quality and produced less often because it has more impact. Blog posts and social media posts are very good at bringing in traffic to your site. In fact, if you are going to focus on only one type of content marketing strategy this should be it. Website page and product descriptions are also good at generating traffic but further more can be used to convert that traffic to leads and or/buyers. Product descriptions are crucial for SEO as well. There are a few different type of landing pages to consider. Some are used for PPC, other for sales, and this one for traffic. This type of landing page is an SEO style page. It’s keyword heavy and designed to bring in search traffic for highly valuable keywords. This is a different type of landing page and is designed to convert traffic to leads. It can be a giveaway, a download, or request for a call. All these things entice people to give you their email. We like emails. Emails are a good thing. Lastly, the most effective and high effort type of content is a sales page. Why? Because this is where you make the money honey. Now once you’ve converted your traffic to leads and sales it’s time to nurture them so the leads turn into buyers and the buyers turn into repeat customers. This content has a focus on nurturing the leads and prospects you have. At the very bottom of the list is website content. This is good content but rarely does it nurture. It can educate and inform, but nurturing needs a bit more. Blog posts and social media posts are good nurturing tools assuming that people are coming back for more. They can be produced often enough to keep you front of mind and if the content works for your customers it will bring them into your world. Email is one of the most overlooked tools in your arsenal when it comes to nurturing. Most companies are not emailing enough. Yea, I said it. You are probably not emailing enough. It’s still an intimate form of getting in front of people and it can highlight your personality as a business while encouraging sales. People like to see you. It gives that connection. Video connects like no other form of content marketing. It should be used wisely to allow people to know who you are. It increases trust. Lastly, white papers, webinars and ebooks are very high quality that can make you an expert in your industry. When you are an expert, you are trusted. Feeling better about this whole content marketing thing? I hope so. Yes this is true that every content has different-different purpose, we can not use the same content for different-different purpose. And more important is that blogging, social media play key channels in driving traffic and growth for the company. 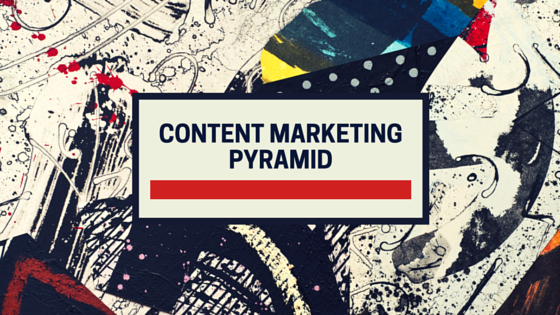 Along with these content marketing pyramid mentioned above, presentation (ppt) also help us a lot. As per Hubspot report, slideshare marketing is contributing great efforts and it listed under top 20 marketing tools.